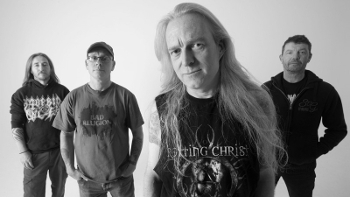 Memoriam is the British old-school death metal band with two ex-Bolt Thrower members and two Benediction members. Their debut For The Fallen is up for pre-order on Nuclear Blast Records: LP, CD, cassette, and bundles. It’s also up for digital orders. The release date is March 31, 2017. Nuclear Blast has been pumping the band on YouTube with four official trailers and two tracks from the album. See below for videos on this new band full of death metal veterans. As more videos come out we’ll post them here! This entry was posted in News, Videos and tagged benediction, Bolt Thrower, death metal, Memoriam, UK by Editor. Bookmark the permalink.